I hope this Christmas has ended a year of happiness and health for all of you. We've been really lucky here. This year we spent Christmas in our new house and it was just perfect and lovely. I got to serve a yummy turkey dinner to our little family of four plus a dear friend, "Auntie" (an honorary Auntie) Julie, and Matt's Uncle Jim. It felt like I was rounding up that last bit of what makes the holidays truly perfect. Being home and spending time together. I stayed up too late last night. I swear I was more excited about Christmas morning than my girls were! Iris and Matt woke Eloise and I up at 8:30. Could have been MUCH worse. We had a modest Christmas at our house, very much on purpose (which we are blessed that it wasn't out of necessity). This year the girls got a few gifts, including books, a decorative nutcracker, and jammies. 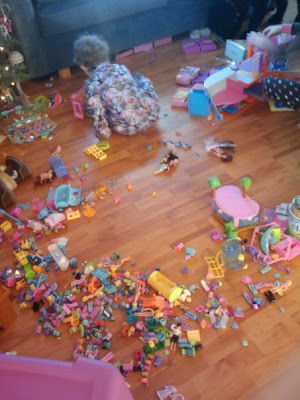 Their big Santa gift was a huge bin of Polly Pocket toys that I bought off of Craigslist a while back. Yet again Matt spent way more on me than I did on him (ahem!) but we bought very very practical items for each other. Our "real" gift will come when the Rock Band company finally puts out more sets for the Wii! Ha ha. Luckily Santa left us a note explaining the situation. I called this the "Polly Pocketpalooza"
The girls spent a good part of the day spread out on the floor with their Pollys. I baked bread and heated left-overs for lunch and Matt relaxed. We took a trip to the park. Matt showed me how to put new songs on my neglected ipod. We went out for Thai food for dinner. I spent a good amount of time today chatting on the phone with my mom, then my sister and finally my mother-in-law. 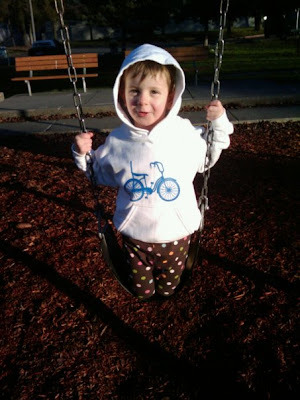 Eloise showing off her new sweatshirt from Grandma Lynn. Such a low-key day. I do wish we had MORE family around to spend it with-- every year I miss the giant get-togethers that our family back in WI have. I am not sure if/when we'll ever go back for another one. Maybe when the girls are a couple of years older and easier travellers. Now we'll take a few days to relax a bit more before heading to Central Washington to visit my in-laws. More presents, more relaxing and surely more eating will ensue!